ภาพถ่ายทางอากาศของโรงไฟฟ้าใน พ.ศ. 2518 showing sea walls and completed reactors showing, reading left (South) to right (North), Units 4,3,2,1 and 5, with Unit 6, on the right, then under construction. ↑ "Explosion at Japanese nuclear plant raises fears". Usatoday.Com. สืบค้นเมื่อ 2011-03-12. ↑ 3.0 3.1 3.2 "Nuclear Reactor Maps: Fukushima-Daiichi". Council for Security Cooperation in the Asia Pacific. สืบค้นเมื่อ 14 March 2011. ↑ "Third Japanese reactor to load MOX". World Nuclear News. 2010-08-10. สืบค้นเมื่อ March 12, 2011. ↑ "Fact Sheet on Fukushima Nuclear Power Plant" (PDF). Nuclear Information and Resource Service. 13 March 2011. สืบค้นเมื่อ 13 March 2011. ↑ Sandia National Laboratories (July 2006). "Containment Integrity Research at Sandia National Laboratories - An Overview" (PDF). U.S. Nuclear Regulatory Commission. NUREG/CR-6906, SAND2006-2274P. สืบค้นเมื่อ 13 March 2011. ↑ "Fukushima Daiichi Information Screen". Icjt.org. สืบค้นเมื่อ 2011-03-15. ↑ Yamaguchi, Mari; Donn, Jeff (March 12, 2011). "Japan quake causes emergencies at 5 nuke reactors". Forbes. Archived from the original on March 17, 2011. สืบค้นเมื่อ March 12, 2011. ↑ 11.0 11.1 "Reactors in operation". IAEA. 31 December 2009. สืบค้นเมื่อ March 12, 2011. 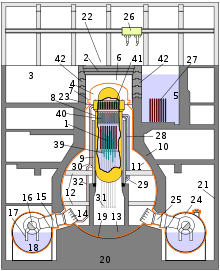 ↑ 12.0 12.1 12.2 12.3 12.4 "Japan: Nuclear Power Reactors". Power Reactor Information System - PRIS. IAEA. สืบค้นเมื่อ 14 March 2011. ↑ 13.0 13.1 "Nuclear Power in Japan". World Nuclear Association. 2011-02-24. สืบค้นเมื่อ March 12, 2011. ↑ Black, Richard. "Reactor breach worsens prospects". BBC News. สืบค้นเมื่อ March 17, 2011. ↑ Biela Liwag. "Government Scientists on Japan Nuke Meltdown "No need to worry"". Noypi.ph. สืบค้นเมื่อ March 14, 2011. หน้านี้แก้ไขล่าสุดเมื่อวันที่ 11 มีนาคม 2562 เวลา 19:14 น.